I tabulate my walking miles at the end of each month, unlike Miz Mik who totals her miles weekly. I like the feeling that I have some miles behind me. My pedometer broke in early September and was replaced within a week by a new one and I've been wearing that every day (except on Sundays out at the Renaissance Faire). I've been averaging two to four miles a day if I treadmill first thing in the morning, 1.5 to 2.5 miles if I don't. August totals found me past my meeting with Gildor and hiding from a Black Rider near the Stock-brook. By the end of September I am already in the Old Forest, just about to meet up with Old Man Willow and Tom Bombadil. I feel like I am actually starting to get somewhere now that I'm out of the Shire and truly having "An Adventure". 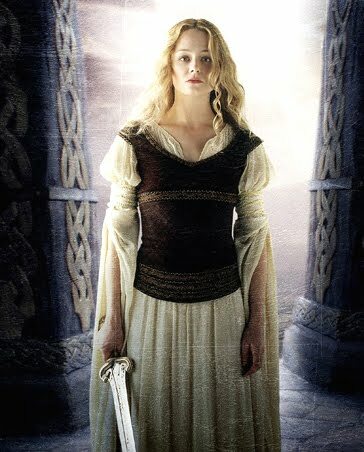 Once more my thanks go out to Surgical Steel who directed me to the Eowyn Challenge more than a year ago. I love the fact that I'm walking to Rivendell while trying to get my weight under control. I adored this view of Edoras with the mountains in the background. strength. I wanted to live there from the first sight. Good for you! What a great weight loss inspiration. I can't wait for retirement, whenever that will be. It would take a LONG time for me to be bored. I have so much that I want to do, and DH thinks he'll be bored stiff (which will mean he will need entertainment *sigh*). You're lucky you've got Pippin - she's self-entertaining. My mom was that way, regarding needing something to do. She would get up each day at the same time, watch her news, make her breakfast, go for a garden trawl and then come in for lunch. Every day. Afternoons were soaps and any household chores. And she was retired for something like 20 years. She had a treadmill for those days when it snowed or rained and she'd walk walk walk. She got so good she actually walked in to Georgetown, about 3 miles or so, away to do her shopping. Funny woman. She needed a ride home. Dunno what she was thinking LOL she said the same thing. You are miles ahead of me but I see that elf flag flying every time you make a hilltop and I am determined to, if not catch up to you, then meet you for wine and cakes in Rivendell. We'll sing off-key songs to the elves and make them plug their ears with croissants. My family has always been excellent at self-entertaining. My DH's family, however, have always relied on others to set their schedule. That would drive me crazy. Oh well, we'll either work it out or not, but it will be an interesting journey - LOL. I think I would have enjoyed your Mom, she sounds like a stubborn and gutsy woman - just my style. I am cruising towards Bree, but if needed I will backtrack to Rivendell when you get there just to share cakes and tea with you, Bilbo and the elves.